When was the last time you made wild rice? Can’t remember or think it’s only for holidays? This versatile ingredient deserves more attention and a place in your meal rotation. Once you check out these delicious and healthy wild rice recipes, you’ll be adding wild rice to your repertiore regularly. Wild rice also has a decent amount of fiber, magnesium, and potassium, things most of us fall short on. It also serves up a healthy dose of antioxidants. Wild rice is gluten-free and technically not a grain but the seed of a marsh grass, so those avoiding grains can enjoy it as well. It’s easy to cook (more forgiving than regular rice as well as more nutritious). And there are so many ways to use it! Plain, wild rice is a tasty simple side dish for chicken or fish. Throw some of your leftover wild rice in broth with some veggies for a delicious and easy soup. Then use more leftover wild rice for a tasty salad (recipe below). Wild rice takes awhile to cook, so I like to make a large batch when I cook something like salmon and serve it as a simple side with a vegetable like roasted asparagus. The leftovers are then transformed into numerous other dishes: A couple nights later, I toss it with vegetables and spices and maybe some of the leftover fish for a filling and easy salad. Another night kids mix it into chicken broth. I freeze some for nights when I need a quick side for the sometimes fussy little diners in my house. If you prefer crock pot cooking, check out these instructions for crockpot wild rice. Since this site’s all about practical, and the rice itself takes awhile to cook, I did some careful snooping to find a few wild rice recipes that wouldn’t take too much time or effort. I don’t know about you, but when the ingredient list takes up most of the page, I move on. You’re on board with easy, right? My absolute favorite thing to do with leftover wild rice is transform it into an incredibly easy but completely satisfying protein-packed salad. Call it a bowl, if you like, it’s filling enough to work for dinner and packs well for lunches, picnics and so on. Here’s my easy-peasy template for wild rice salad. You might use up all your wild rice on that, it’s so good, but if you have more, here are some tempting-looking, not-too-complicated wild rice recipes. Several of these call for a wild rice blend, but there’s no reason you couldn’t go 100 % wild rice. ♦ Wild rice is native to my now-home state of Minnesota, where they call casseroles “hotdish.” So I had to include a hotdish recipe here. One of the few that didn’t call for the traditional canned soup (no thanks — here’s one of many reasons to avoid canned food) was a chicken and wild rice casserole from Well Plated. 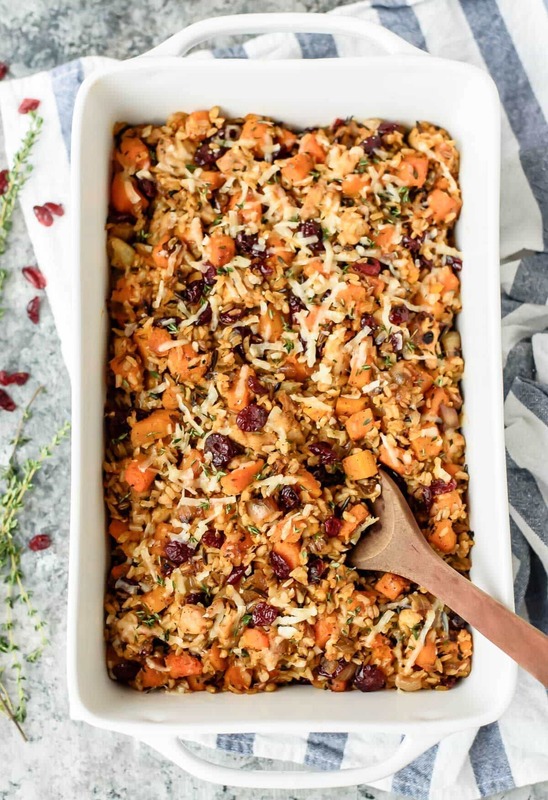 Wild rice goes wonderfully with sweet autumn veggies like butternut squash. ♦ Iowa Girl Eats shares a simple-to-prepare but tempting crock pot chicken and wild rice soup. ♦ Gimme Some Oven adds in lots of fall vegetables to her cozy autumn wild rice soup. ♦ Mushrooms and wild rice go SO well together, and this slow cooker mushroom wild rice soup from Amuse Your Bouche looks just perfect for a cold winter night. I will definitely be trying this when the weather cools again. ♦ Pinch of Yum has a tempting recipe for Thanksgiving salad that I definitely would not save for holidays. It features mangos and looks like a wonderful anytime lunch. ♦ Detoxinista uses fruit, nuts, and an orange vinaigrette in her wild rice salad. ♦ Some folks even like wild rice for breakfast! Check out these recipes for a wild rice breakfast bake, a crockpot porridge and a wild rice breakfast pudding. Mmmm… What’s your favorite way to use wild rice? Share your favorite wild rice recipes in the comments! Using what you have on hand is just one strategy for eating healthy on a budget. Find lots more in my FREE guide, Affordable Healthy Food. Pin to save these wild rice recipes for later! I love wild rice and usually make soup with it. We eat a lot of rice, so your recipe fits right in with our everyday meals. I am a huge fan of wild rice. it really lends itself to so many dishes. This looks absolutely amazing. I love wild rice and I don’t cook it enough at home. Thanks for sharing! It’s so nice to learn that wild rice is a marsh grass seed, not a grain and that a 1-cup serving has only about 160 calories and more than 6 grams of protein, twice as much as in most rice as well as a decent amount of fiber, magnesium, and potassium. I am so delighted that you shared your healthy and delectable Wild Rice Bowl and other wild rice recipes with us at the Healthy Happy Green Natural Party! I’m Pinning and sharing this! I’m a native Minnesotan too, we live in northern MN. My brother and dad go wild ricing and usually bring in around 300 pounds a season to sell and give away to family etc. So I normally reap some pretty great benefits in the form of about ten pounds of free wild rice a year 😀 It is, without a doubt, one of my of my very favorite meal additions, thank you for the recipes, followed! What a great collection of recipes!! My husband loves rice in any form!! Thanks for sharing on My 2 Favorite Things on Thursday!! Hope to see you again this week!! Pinned! Definitely I will prep slow cooker mushroom wild rice soup on the weekend for my family. These are so Instagrammable and adorable! Wow! This looks amazing! I would try making these slow cooker mushroom wild rice soup for sure! Can I post it on my blog? Hi Julia, that soup is really good. That recipe is from Amuse Your Bouche. You can always link to posts or recipes on your blog, but you would have to get permission from the owner about republishing anything or using an image.